Do you know the legend of the Varaha Avatar of Vishnu? Being a part of the Hindu Trinity, Lord Vishnu also known as ‘Dashavatara’ takes ten incarnations or avatars to maintain balance in the universe. Each of Vishnu’s Avatars has the same purpose i.e. to maintain balance and protect mankind but it is fulfilled with different means by different avatars. The third avatar of Lord Vishnu is the Varaha Avatar which means “boar” in Sanskrit. He took this avatar in the Satya Yug. The Varaha avatar story starts with the Doorkeepers of Lord Vishnu. Lord Vishnu lived in Vaikunta. Vaikunta was guarded by two gatekeepers, Jaya and Vijaya. They both loved Lord Vishnu and felt honoured that they are protecting Lord Vishnu. Many people came to visit Lord Vishnu and it was Jaya and Vijaya’s job to allow people with grievances to see the Lord. Once the four sons of Lord Brahma visited Vaikunt, the home of Lord Vishnu to pay their respect and seek Vishnu’s blessings. Over time the two guards of Vaikunt Jaya and Vijaya had grown proud and they denied the entry to the four sages without a reason. To teach them a lesson and put them in the right track, the four sages cursed that they shall lose their position and be born on the earth as humans. When Jaya and Vijaya realized their mistake, they pleaded them but Lord Brahma’s son wouldn’t listen and the curse was revised that they shall be born thrice on the earth as demons. After hearing some noises lord Vishnu arrived at the spot and apologized for his guards, saying they were just doing their duty. But the curse can’t be taken back said Lord Brahma’s sons and left. Lord Vishnu addressed his guards and said that the curse would be removed if both of them would meet their death at his hands in the human form. After that in their first birth, they were born as Hiranyakashyap and Hiranyaksha. When they were born, all the three worlds were shaken and a strong tremble could be felt. Indra got terrified and approached Vishnu. Vishnu assured Indra (god of the heavens) that when the right time will come; he would kill the demons and save all the worlds. Hiranyaksha performed severe atonement to impress Lord Brahma and secured a boon that he shall not be killed by any demon, human, animal or gods. After gaining the boon, Hiranyaksha started torturing people as he was assured of his immortality. He was such a giant that mother earth trembled as he walked and the sky thundered when he yelled. Once Hiranyaksha invaded Indra’s palace in order to harass demigods and grabbed the mother earth and submerged it in Patala Loka (underworld or netherworld). After seeing this Lord Brahma became worried and thought that mother earth should be rescued. He then recalled that Hiranyaksha cannot be destroyed by him because he has given him a boon. So he thought of taking help from Lord Vishnu. While Brahma was praying to Lord Vishnu, a tiny boar fell from his nostrils. Wondering what that creature is, it grew and grew till it reached the size of a large Mountain. It was Lord Vishnu and he confronted that he will enter the ocean and rescue mother earth. He took the form of a boar to kill Hiranyaksha because while taking the boon from Lord Brahma, he forgot to mention boar among all the animals. The Boar dug his tusk into the ocean-bed and lifted Mother Earth onto it, and began rising towards the surface. Hiranyaksha rushed towards him and challenged Lord Vishnu in the form of a Boar to have a duel with him but Vishnu ignored all his warnings. He continued rising towards the surface until he succeeded in escaping earth at a safe place. Lord Vishnu then turned to face Hiranyaksha and hit hard on his face and tossed him in the air. He fell over his head and died on the spot. In this way, Lord Vishnu in Varaha avatar killed Hiranyaksha and saved Mother Earth. 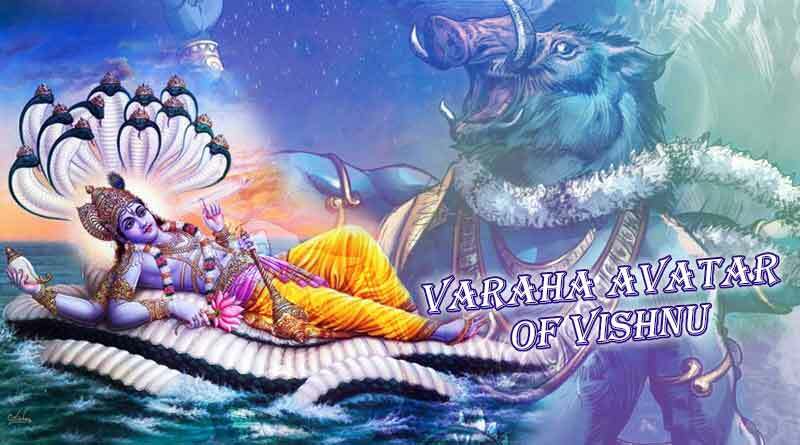 For more articles like ‘The Legend of Varaha Avatar of Vishnu’, do follow us on Facebook, Twitter, and Instagram.